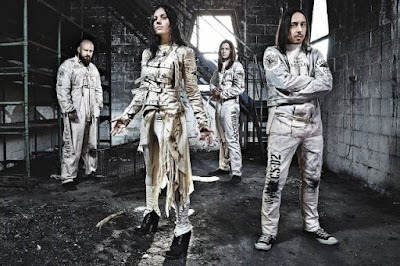 MetalRockNews: Lacuna Coil's Cristina Scabbia: "Maus's departure resulted in a new energy within the band"
Lacuna Coil's Cristina Scabbia: "Maus's departure resulted in a new energy within the band"
Lacuna Coil's Cristina Scabbia and Andrea Ferro were recently interviewed by Metal Wani, you can read some excerpts below. About the lineup changes in Lacuna Coil that took place prior to the recording of the band's new album, "Delirium", Cristina said: "Two of the members left two years ago… They just left, because they just wanted their life and settle and they were tired of touring. And then we continued for a while with Maus. And then Maus decided to resign when we were entering the studio, pretty much, because he felt that he couldn't express himself completely anymore, or whatever reason he decided to leave for. But the songwriters of Lacuna Coil are still in the band, because it was always Marco, the writer of the music and the internal producer of the band, and it was always Andrea and I writing the lyrics. And Ryan came in and added so much with his incredible drumming and his persona. So, honestly, it didn't really change the balance. Of course, it's always sad when a person that you shared so much time with decides to take a different path, but it's not that he died or he just left in a bad term or there was drama going on. So, I mean, it's a natural evolution. I think it's normal in a family; I think it's normal in your relationship. It can happen. Actually, Maus's departure resulted in a new energy within the band. It's, like, this is not even the next chaper; it's the new book of Lacuna Coil. A new lineup, a lot of guests in the record. Marco playing guitars. First album self-produced by us, and we were in total control. Everything is new, and we're excited like kids, like it's the first album we've ever done." About how Lacuna Coil went about enlisting guest guitarists, including Myles Kennedy (Alter Bridge) and Mark Vollelunga (Nothing More) to play on "Delirium", Cristina said: "Myles, he's a friend of ours. I had the chance to collaborate with Alter Bridge years ago, so since then we've been in touch; we've been writing each other. When Maus decided to resign, we thought that it would be cool to invite some friends to contribute to the record… speaking about the guitar parts. And we had some slots open for solo parts, and we started to think about friends that were playing guitars. And Myles Kennedy is really known as an amazing vocalist, amazing singer, but not a lot of people know that he's a great guitar player as well. So I think it's cool that he contributed, but not singing, as everybody would expect, but with his guitar. So we let him free to do whatever he wanted to do. We didn't hear the solo up until he sent it to us, because we recorded the album in Italy. And the same was with Mark Vollelunga of Nothing More. He's a friend of ours, because we toured together with Nothing More in the past, and they put on an amazing show; they're great musicians." Andrea: "Nothing More did their first national tour in America opening for us; so that's how we met them. And then we've been in touch all the time. When they played Milan, we went out for beers and drinks and food, and then it was just natural to ask him. He has such a unique style of playing that he did something very great on the song, I think." Cristina: "And then Marco Barusso is also the sound engineer of the record, and he's a good guitar player too. And the same for Diego Cavallotti and Alessandro La Porta; they are friends of ours that came in, and that made the album even more dynamic and intense, so we could have different things in it."